White-rumped Sandpiper in Mt. Olive Twp. A White-rumped Sandpiper (WRSA) was discovered at Tilcon Lake in Mt. Olive Twp. by Alan Boyd today. Reporting this as a rare species in Morris County is an understatement. The only other record in the eBird database for the county is from 1970 although it is suspected other records do exist. The WRSA is not easy to find. It is keeping company with a Killdeer in an out-of-the-way cove along the mid-northwest shore of the lake. Alan’s gracious generosity with his time was the reason others were able to see this bird late in the afternoon. The WRSA has a prominent supercilium, black legs, primary tips that extend beyond the tail and streaks down the flanks. A scope view showed the reddish coloration at the base of the lower mandible (this may be visible in the photos). A late-in-the-season Spotted Sandpiper was also seen by Alan. It was not relocated in the late afternoon. 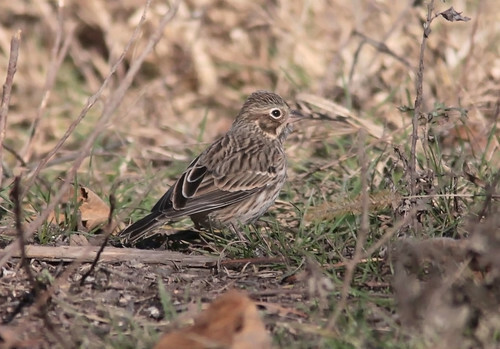 Via eBird, Tom Smith reports a Vesper Sparrow at Troy Meadows today in the trap shoot area along Troy Meadows Road. This has become a reliable Vesper Sparrow location over the years. A photo by Tom is below. Sandhill Cranes in Franklin Twp. The two Sandhill Cranes on Randolph Road, Franklin Township were reported by various observers today.